As a business owner you have more important things to do than to manage your bookkeeping. With New Stone Tax Services' bookkeeping services, you can spend your time focusing on more important business operations, like growing your business or generating more profit, while we take care of your books for you. 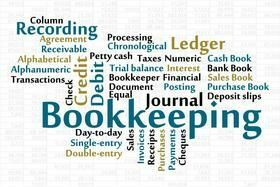 New Stone's bookkeeping services form the solid foundation of your small business accounting system. You can customize the package of services you receive by adding payroll, tax planning, tax preparation, or any of our other services. Reconciling your business bookkeeping each month allows us to keep your bank account, accounting, and taxes up-to-date. Know how your business is doing. You can't really know unless all accounts are reconciled and properly accounted for on your financial statement. Sleep Better. You will sleep more peacefully at night knowing your bookkeeping is accurate, in balance and that all funds, accounts, checks and disbursed funds are properly accounted for. The general ledger is the core of your business bookkeeping company's financial records. These records constitute the central "books" of your system. Since every transaction flows through the general ledger, a problem with your general ledger throws off all your books.